The metabolic syndrome is a highly prevalent clinical entity. The recent Adult Treatment Panel (ATP III) guidelines have called specific attention to the importance of targeting the cardiovascular risk factors of the metabolic syndrome as a method of risk reduction therapy. The main factors characteristic of this syndrome are abdominal obesity, atherogenic dyslipidemia, elevated blood pressure, insulin resistance (with or without glucose intolerance), prothrombotic and proinflammatory states. An insulin resistance following nuclear peroxisome proliferator activated receptors (PPAR) deactivation (mainly obesity-related) is the key phase of metabolic syndrome initiation. Afterwards, there are 2 principal pathways of metabolic syndrome development: 1) with preserved pancreatic beta cells function and insulin hypersecretion which can compensate for insulin resistance. This pathway leads mainly to the macrovascular complications of metabolic syndrome; 2) with massive damage of pancreatic beta cells leading to progressively decrease of insulin secretion and to hyperglycemia (e.g. overt type 2 diabetes). This pathway leads to both microvascular and macrovascular complications. We suggest that a PPAR-based appraisal of metabolic syndrome and type 2 diabetes may improve our understanding of these diseases and set a basis for a comprehensive approach in their treatment. Type 2 diabetes mellitus and obesity, major health problems worldwide, are considered to be closely related [1–6]. In the majority of cases type 2 diabetes is now widely considered to be one component within a group of disorders called the metabolic syndrome. Factors characteristic of the metabolic syndrome, also known as dysmetabolic syndrome X, are abdominal obesity, atherogenic dyslipidemia (elevated triglyceride [TG] levels, small low-density lipoprotein [LDL] particles, low high-density lipoprotein cholesterol [HDL-C] levels), elevated blood pressure, insulin resistance (with or without glucose intolerance), and prothrombotic and proinflammatory states [7–10]. The factor that dominates in obesity is the permanent elevation of plasma free fatty acid (FFA) and the predominant utilization of lipids by muscles inducing a diminution of glucose uptake and insulin resistance. An insulin-resistant state – as the key phase of metabolic syndrome – constitutes the major risk factor for the development of diabetes mellitus. Hyperinsulinemia appears to be a compensatory mechanism that responds to increased levels of circulating glucose. People who develop type 2 diabetes usually pass through the phases of excessive adipogenesis (obesity), nuclear peroxisome proliferator activated receptors (PPAR) modulation, insulin resistance, hyperinsulinemia, pancreatic beta cells stress and damage leading to progressively decrease of insulin secretion, impaired glucose postprandial and fasting levels [11–14]. Fasting glucose is presumed to remain normal as long as insulin hypersecretion can compensate for insulin resistance. The fall in insulin secretion leading to hyperglicemia occurs as a late phenomenon and, in fact, separates the patients with metabolic syndrome from those with or without overt diabetes (Figure 1). 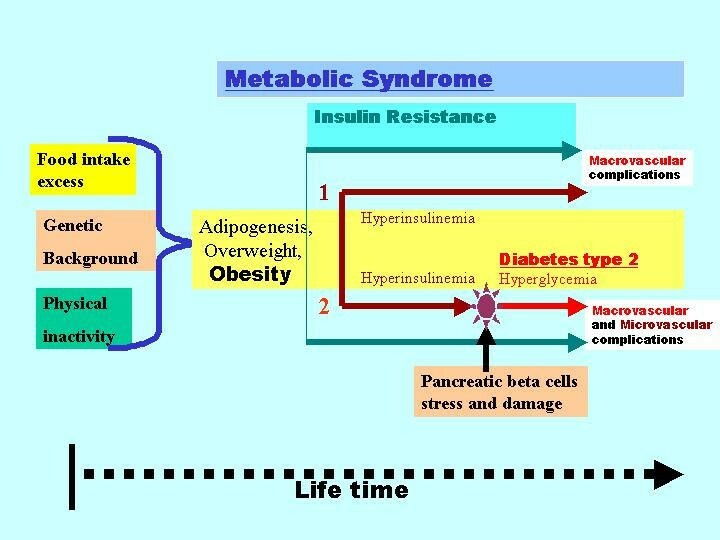 The relationship between metabolic syndrome, insulin resistance, hyperinsulinemia and hyperglycemia (overt type 2 diabetes). An insulin-resistant state following nuclear peroxisome proliferator activated receptors (PPAR) deactivation is the key phase of metabolic syndrome initiation. Afterwards, there are 2 principal pathways of metabolic syndrome development: 1) With preserved pancreatic beta cells function and insulin hypersecretion which can compensate for insulin resistance. This pathway leads mainly to the macrovascular complications of metabolic syndrome; 2) With massive damage of pancreatic beta cells leading to progressively decrease of insulin secretion and to hyperglycemia (e.g. overt type 2 diabetes). This pathway leads both to microvascular and macrovascular complications. Time-related scheme. Table 1 shows the diagnostic criteria for the metabolic syndrome. The common underlying element of these adverse risk factors for progression of atherosclerosis is insulin resistance [10, 15]. Metabolic syndrome is a term used to define a patient who presents with 3 or more of 5 risk factors: (1) abdominal obesity and waist circumference for men greater than 102 cm or 40 inches, and for women greater than 88 cm or 35 inches; (2) elevated triglycerides, defined as equal to or greater than 150 mg/dL; (3) low HDL cholesterol. Overall for the Adult Treatment Panel (ATP)-III guidelines, low HDL cholesterol is defined as under 40 mg/dL; previously it was under 35 mg/dL (for the purposes of the metabolic syndrome, there are different values for men and women: less than 40 mg/dL for men and less than 50 mg/dL for women); (4) Elevated blood pressure, defined according to lower values than those usually used to define hypertension: systolic over 130 mmHg or diastolic over 85 mmHg. (5) fasting glucose equal to or greater than 110 mg/dL [10, 15]. 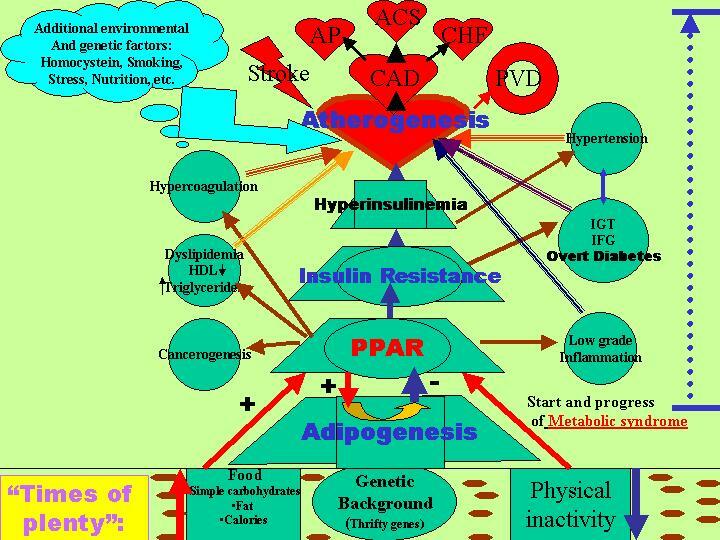 The 2001 ATP III guidelines have called specific attention to the importance of targeting the cardiovascular risk factors of the metabolic syndrome as a method of risk reduction therapy . The ATP III guidelines also call for type 2 diabetes mellitus to be given the status of "cardiovascular disease risk equivalent"; that is, patients with type 2 diabetes are considered to have an increased risk, equivalent to those who have established heart disease. 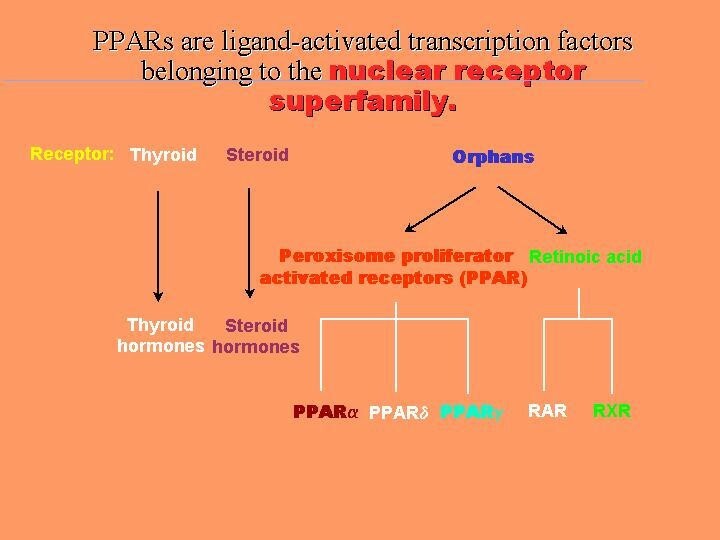 The peroxisome proliferator activated receptors (PPARs) in the framework of the nuclear receptors superfamily. The so-called orphan receptors (identified before their natural ligand) include PPAR and retinoid X receptors (RXR). There are currently three known subtypes of PPAR: alpha, delta and gamma (g1 and g2). Activated PPAR-alpha stimulates the expression of genes involved in fatty acid and lipoprotein metabolism. PPAR-alpha activators, such as the normolipidemic fibric acids, decrease triglyceride concentrations by increasing the expression of lipoprotein lipase and decreasing apo C-III concentration. Furthermore, they increase HDL-cholesterol by increasing the expression of apo A-I and apo A-II. PPAR-alpha activation by fibric acids improves insulin sensibility and decreases thrombosis and vascular inflammation. PPARalpha ligands also mediate potentially protective changes in the expression of several proteins not involved in lipid metabolism but implicated in the pathogenesis of heart disease. Clinical studies with bezafibrate and gemfibrozil support the hypothesis that these drugs may have a significant protective effect against cardiovascular disease [19, 20]. Activation of the isoform PPAR-gamma improves insulin sensitivity, decreases inflammation, plasma levels of free fatty acids and blood pressure. These lead to inhibition of atherogenesis, improvement of endothelial function and reduction of cardiovascular events. The thiazolidinedione group of insulin-sensitizing drugs are PPARgamma ligands, and these have beneficial effects on serum lipids in diabetic patients and have also been shown to inhibit the progression of atherosclerosis in animal models. However, their efficacy in the prevention of cardiovascular-associated mortality has yet to be determined. Recent studies have found that PPAR delta is also a regulator of serum lipids. However, there are currently no drugs in clinical use that selectively activate this receptor. The modulation of the expression of genes by either PPAR alpha or gamma activators, correlates with the relatively tissue-specific distribution of the respective PPARs: PPAR gamma is expressed predominantly in adipose tissues, whereas PPAR alpha in the liver. PPARgamma was shown to have a key role in adipogenesis and proposed to be a master controller of the "thrifty gene response" leading to efficient energy storage. According to the thrifty gene hypothesis, individuals living in an environment with an unstable food supply could increase their probability of survival if they could maximize storage of surplus energy, for instance as abdominal fat. Exposing this energy-storing genotype to the abundance of food typical in western societies is detrimental, causing insulin resistance and, subsequently, type 2 diabetes [11, 21]. In addition to PPAR, there are a number of other potential thrifty genes, including those that regulate lipolysis or code for the beta3-adrenergic receptor, the hormone-sensitive lipase, and lipoprotein lipase. Type 2 diabetes develops as a consequence of a collision between thrifty genes and a hostile affluent environment. More recently PPARgamma emerged from a role limited to metabolism (diabetes and obesity) to a power player in general transcriptional control of numerous cellular processes, with implications in cell cycle control, carcinogenesis, inflammation, atherosclerosis and immunomodulation. This widened role of PPAR gamma will certainly initiate a new flurry of research, which will not only refine our current (and often partial) knowledge of PPARgamma, but more importantly, will also establish that this receptor has a definite role as a primary link adapting cellular, tissue and whole body homeostasis to energy stores. Based on these new concepts, we propose a novel map of a cluster of metabolic syndrome, cardiovascular risk factors and diseases, which all are developed and linked through PPARs (Figure 3). The atherogenesis tree, showing the complex interrelationship between hereditary and environmental factors in the pathogenesis of metabolic syndrome and atherothrombotic events. The central role of an insulin-resistant state following adipogenesis and nuclear peroxisome proliferator activated receptors (PPAR) deactivation is emphasized. CAD – coronary artery disease; AP – angina pectoris; ACS – acute coronary syndromes; CHF – congestive heart failure; PVD – peripheral vascular disease; HDL – high density lipoproteins cholesterol; IGT – impaired glucose tolerance; IFG – impaired fasting glucose. Because of its critical and central role in the development of metabolic syndrome, type 2 diabetes and many cardiovascular disorders, we believe that targeted treatment of PPAR will be a critical component of care in shortcoming future (Figure 4). Treating metabolic syndrome can prevent or ameliorate cardiovascular disease and type 2 diabetes [22–27]. It is obvious that the cornerstones of treatment for the metabolic syndrome are dietary modification and increased physical activity. The Diabetes Prevention Program (DPP) results have shown that individualized, systematic and intensive lifestyle interventions (including dietary changes, increased physical activity and weight loss) are the most effective means of prevention of type 2 diabetes in general high risk populations (unfortunately they are not easily applied in general practice) . Pharmacological interventions by some medications which influence primary glucose metabolism (metformin and acarbose) or induced weight loss (orlistat, combined with dietary intervention) can also effectively delay progression to type 2 diabetes [24–26], but the magnitude of the benefit seems to be somewhat less (58% for DPP lifestyle changes vs. 31% for metformin and 25% for acarbose). For the time being, the goals and methods of treating hypertension, inflammation, hypercoagulopathy and dyslipidemia are the same for people with metabolic syndrome and for the general population [22–27]. 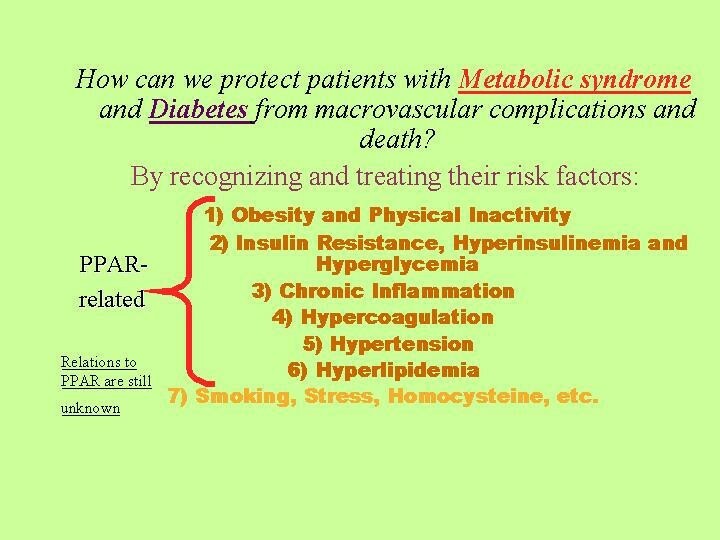 The protection of patients with metabolic syndrome and diabetes: focus on treatment of PPAR-related risk factors. In conclusion, the metabolic syndrome is a highly prevalent clinical entity. Obesity, PPAR modulation and insulin resistance are the central components of this complex syndrome. The fall in insulin secretion leading to hyperglicemia separates patients with metabolic syndrome from those with or without overt diabetes. We suggest that a PPAR-based appraisal of metabolic syndrome and type 2 diabetes may improve our understanding of these diseases and set a basis for a comprehensive approach in their treatment.